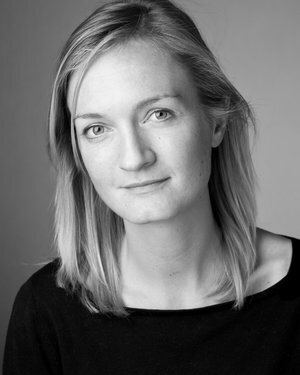 Davina Langdale studied Zoology at Bristol University, and worked with 93 chimpanzees and a hippo in Northern Zambia. She returned to the UK to take a postgraduate diploma in journalism at the London College of Printing, and after a brief stint in that field she realised that fiction was her true love. The Brittle Star is her first novel and is set in the Californian wilderness of the 1850s and 60s. When teenager John Evert’s mother’s ranch is attacked, John Evert sets out, against advice, to find the perpetrators. It is the start of what will become an epic quest that takes him to Los Angeles, Texas, Missouri and back, and to the front lines of the American Civil War on a journey that is as much inwards as external. A stunningly assured first novel, it transcends genre boundaries in the same way as Patrick deWitt’s The Sisters Brothers or even Cormac McCarthy. 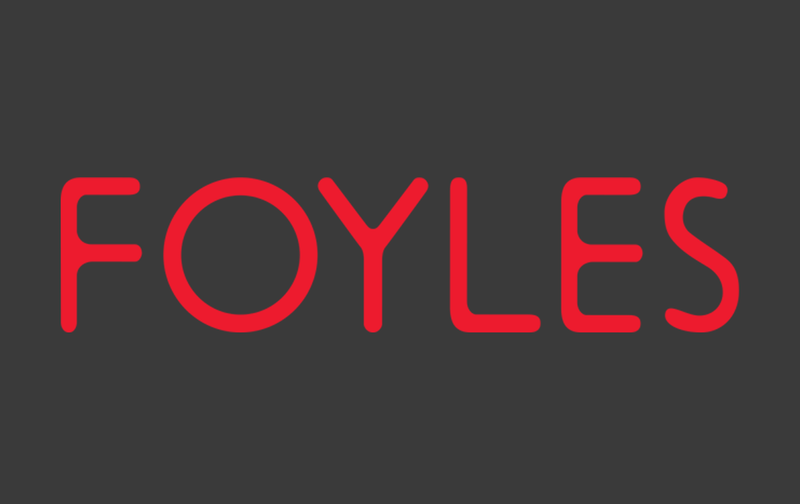 Exlusively for Foyles, we talked to Davina about being inspired by Cormac McCarthy, how the real life John Evert became the ultimate imaginary friend and lifesaver and why she loves the London Library. You chose an unusual and challenging setting for your first novel: the Southern Californian wilderness of the 1860s. What fascinated you about that time and place? When I first read the work of Cormac McCarthy, I felt as though someone was putting into words precisely what I feel about the natural world and man’s place in it. As someone who spent their entire childhood plotting ways to run away to the wilderness to live with animals, his stories felt strangely familiar to me. While I have never attempted to emulate his writing, his subject matter inspired me. Cormac McCarthy’s work is not set in the 1860s like The Brittle Star but his mood and tone pointed me towards America. In 2012 I had retreated from London to the countryside, to Dorset, to think about what sort of book I wanted to write. Whatever the question, I find that spending time in nature always provides the answer. It was while in Dorset that I watched a film adaptation of Thomas Eidson’s book, The Last Ride, called The Missing. It was my lightbulb moment: I realised that this was the time and place I was meant to write about. To this day, I do not know how or why I knew this, but sometimes I think it’s important not to ask too many questions: better to take an idea and run with it. I returned to London, secluded myself in the London Library in St James’s, where I do most of my writing, and began to research the American West. Strangely, perhaps, it never felt challenging to me to write in this period. ‘Deluded’ might be the most appropriate word to describe my lack of consideration of the difficulties I might face writing historical fiction! I may have a tendency to charge into things, but when it comes to writing, I think this can be an advantage. If I had considered all the things that I did not know and all the things that I would need to learn to write convincingly of in this period, then perhaps I would never have been bold enough to begin at all. It was fascinating to learn about the fledgling city of Los Angeles and the American Civil War, both of which I knew little of prior to starting The Brittle Star. I love to learn and thus to research. It must be why I am so happy in the library. Hector Featherstone says to John Evert, ‘We lead an exaggerated life. Some men make their fortune, others lose everything they have…’ Are you yourself drawn to the appeals of an exaggerated life? Absolutely. It’s one of the reasons I studied Zoology at university. Since childhood, adventure and excitement have, to me, meant the wilderness, wild animals and physical danger. I was an avid reader and devoted to the work of Gerald Durrell and Willard Price. Aged 10, I watched the film Gorillas in The Mist and decided that I would be the next Dian Fossey and live with apes. Upon leaving school, I went to Indonesia to spend time in the jungle and see orangutans in the wild. Later, I went to work with chimpanzees in Northern Zambia. I remember a family friend’s horror at the fact that I was heading to the Congolese border as an unaccompanied young woman of 23. I may have done some reckless things in the name of experience. On being challenged to kayak down the Zambezi rapids, I immediately accepted, despite the fact that I had never even been in a kayak. I still remember very clearly how I nearly drowned – but I don’t regret that decision for a moment. I use this experience in The Brittle Star when John Evert and Kusox are swept away in the river. Writing this book may, subconsciously, have been some form of antidote to metropolitan, London life. It does feel as though the wild is calling once more. If life were suddenly to provide the means for me to get on a real horse and ride in the direction of the horizon, any horizon, I would be there like a shot. You studied zoology and then journalism. What made you decide to turn to fiction and what steps did you take to make the dream become a reality? The nights in Zambia were very long and, although I read a great deal, I found myself itching to do something creative, to make something of my own. I had always been very comfortable with words and my school English teacher – an outstanding teacher who was cross that I chose to read Zoology rather than English – had said to me on the last day of school, ‘you’ll come back to English in the end’. And I did, in Zambia, by the light of a paraffin lamp, when I discovered that writing stories is my first love. My intention in taking a post-grad diploma in journalism upon my return from Africa was that I would write about the natural world, but I soon learnt that I did not have the makings of a good journalist. Reportage is not my form: I have never been able to find the elusive ‘hook’ that editors demand. I became side-tracked by London life and suddenly found that I was a City PR consultant. I was very bad at it and I felt strongly that something was missing from my life, so I returned to those notes that I had made in Zambia. One day, I realised I had written 60,000 words, and it became glaringly obvious what I really wanted to do. I quit my job and for the next few years (The Brittle Star was bought by Hodder in the spring of 2015) worked part-time as, variously, a PA, a waitress and, most happily, as a private tutor in English and the Sciences. I still work as a tutor, which I really enjoy, and which provides a good balance to the solitary nature of writing. The characters in your novel are superbly drawn, especially John Evert himself, but also Bill, Kusox, Hector and Robinson, amongst others. How did you set about creating them? 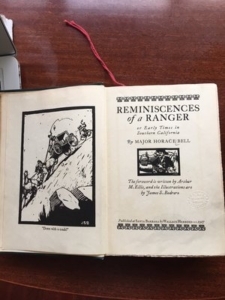 While I was researching the American West in the London Library, I happened to be in the biography stacks when I noticed the gold lettering on a green leather spine: Reminiscences of a Ranger by Major Horace Bell. 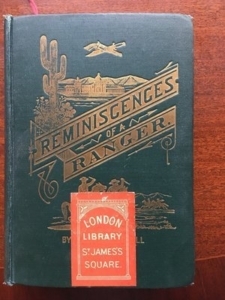 It turned out to be the first-hand account of a Los Angeles ranger of the 1850s and 1860s. It was written in a highly exaggerated style – almost every sentence ended with an exclamation mark – but there I found the seeds for many of my characters and establishments, such as the Bella Union and the Star newspaper. Reminiscences of a Ranger was an absolute gift. Without it, The Brittle Star would never have turned out as it did. Bill came from that book: he was a real man who lived in LA at that time, although of course his story was much embellished. His background and some of his exploits were detailed in Bell’s book but, in terms of his character, I wonder whether he may have grown in part out of my appreciation of Charles Portis’s Rooster Cogburn in True Grit. Hector Featherstone must be partly based upon my father, who is also a barrister, and who introduced me to the theatre of the courtroom, but my father is much more humorous than Hector Featherstone. I am sure Harper Lee’s Atticus Finch had more than a little to do with him too, but all my characters seemed to take flight at one point or another and simply became their own people. It was not long before they were saying and doing things that seemed to have nothing to do with me at all. In that moment, it was as though this boy had walked up next to me, taken off his hat, sat down and began to speak. I do not know where he came from but he certainly seemed to come from outside me, fully formed, and he has been, in so many ways, the ultimate imaginary friend and lifesaver. He really turned everything around for me in terms of my writing career. Writing John Evert and his story has been the most enormous adventure. Robinson is particularly fascinating. Was she based on anyone? Were you ever tempted to reveal more about her or was keeping her enigmatic more important? At the beginning, I was concerned that Robinson was not terribly likeable and that readers would misunderstand her. I know her so well. I know why she is the way she is, why she is so defensive and brittle, and I love her for it because she has had such a tough time. My female lead was, originally, a native American – she was the ‘brittle star’ of the title – but over time that female lead turned into Beth Robinson. I feel protective of all my characters but I feel most protective of her and, for that reason, I find it impossible to reveal any more about her. It is not that I do not know it all – I do – but it would feel strangely disloyal to her if I were to reveal any more. To me, she really does exist, as a living, breathing human being, and so her feelings matter. It would be like revealing things that a friend had told me in strictest confidence. The days when the words did not come. Perhaps other writers are better at dismissing an unproductive day, but I take it personally and can get morose. I also find that if I am to write at all I have to devote myself to it completely and become a bit of a recluse. I had to say no to all social engagements and bury myself in the countryside or the library because unless I felt that I had the entire day stretching out ahead of me uninterrupted, I would get anxious and not able to get in the right frame of mind to write. I was not unhappy to do that, but it can be isolating and lonely at times. I am certainly making up for this now and for the last few months have said yes to absolutely everything. One of the reasons I need to start a new book as soon as possible – apart from the fact that I am restless to do so – is for the sake of my liver. Writing keeps me on the straight and narrow. I find writing strangely tiring. I am forever falling asleep when writing and this can be challenging in terms of making the best use of my time. I do not have the luxury of being able to write all day: half my week is spent tutoring and the other half writing, so I do feel the need to make the most of my writing time. I think the frequent nodding off may be related to the way I wrote this book. I did so either completely unconsciously or from the subconscious. I can say with all honesty that I very rarely thought about it. All my character work seemed to go on when I was asleep, so perhaps the overwhelming sensation of the need for a nap was simply my mind telling me to switch off one part of my brain and use another. Of course, I did think about it actively when working out plot issues, particularly relating to courtroom scenes. 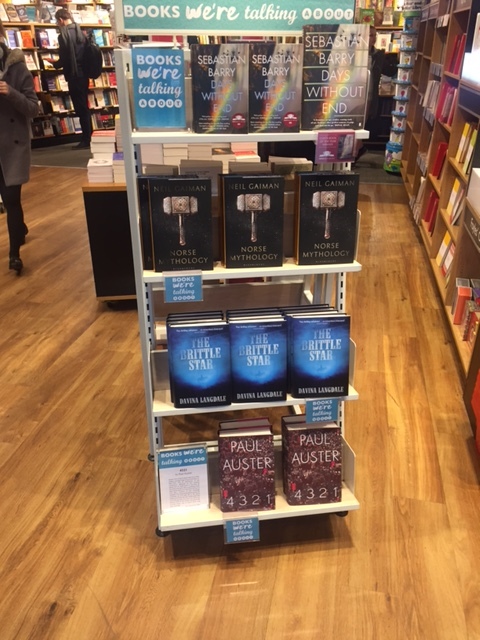 I had the most brilliant editor at Hodder, Anne Perry, who spotted all sorts of holes in my plot and came up with invaluable advice as to ways to fix them. It was such a pleasure to work with her and I really enjoyed that moment of collaboration with someone really bright. Her input made a huge difference. How did you go about doing the research to bring the period so vividly to life? As mentioned above, this book would never have come into being without The London Library. It is my favourite place in London. John Betjeman once said that, in the event of Armageddon, he would like to be on the premises of Peter Jones since nothing unpleasant could ever happen there. That is exactly how I feel about The London Library. It not only provided the research material for the book but it provided the perfect place for me to write. I find it impossible to work at home but the moment I walk through the library door, I shift into a more productive and creative mind-set. The army provided a refuge for John and Bill. Was this the case for many other soldiers at the time? I must admit that I do not know the answer to this. To me, it seemed the obvious place to which Bill would run. He was a military man and would have no trouble disguising himself effectively in the ranks. Also, being the sort of man that he is, he would want to join the fight. Having taken the opposing side to the Order of the Lone Star he would want to fight them, out of sheer bloody-mindedness, if nothing else! The book has been described as a western. Were you conscious of writing within a particular genre, with all that implied, and if so, did you find that liberating or restricting? Many people have asked me, ‘why a western?’ My answer is always, ‘why not?’ I believe strongly in gut instinct, in doing what feels right, without much pause to ask the reason why. If you ask too many questions, you never go anywhere. I think it’s better to leap and ask questions later. This can lead me into trouble in some aspects of life but not, it seems, when it comes to writing. When it comes to writing, this impulsiveness is only a good thing. I never really thought about it, strange as that may sound. I wrote this book entirely on instinct and I can trace a direct line from Cormac McCarthy’s books All the Pretty Horsesand The Crossing to watching that Thomas Eidson movie to finding Reminiscences of a Ranger in the library. I never planned to write a western and, in many ways, this book is not a western at all; for me – so much of it is symbolic. I never felt restricted by the genre; if anything I found it hugely liberating because, at that time and place, anything could happen. Will your next book be another ‘western’ or something completely different? I have two ideas brewing. Both are historical fiction but neither are westerns. One is actually a play rather than a novel – it may be madness to think I can write a play as I don’t know anything about writing plays, but then, I didn’t know anything about writing novels until I wrote one. I am glad that I never had any formal training in writing. Perhaps if you are not really aware of what the rules are you have less concern about breaking them. In terms of whether I would write another western, I do have a suspicion that I have found a time and place in which I can move very freely and, in terms of tone, The Brittle Star is written not so much in a ‘western’ tone as my tone. I seem to express myself in an old-fashioned way. If more than a couple of people wished me to return to this time and place, then I would be delighted to do so. In this world, there is never a dull moment.